On the 23rd January our PPC Canary Wharf event opened its doors to property investors and developers across the UK, all interested in how to get started in development or how to make their current developments more profitable. With Director at the industry renowned Galliard Homes David Galman taking the stage with the UK’s leading property expert and founder of Premier Property Kam Dovedi, the event most certainly did not disappoint. David and Kam took part and led some excellent discussions in the packed 125-people-filled-room, with everyone on the edge of their seats paying close attention to how they could use this opportunity to benefit them. Is it still worth investing in London? How do you find regeneration areas? How do you find development sites? How do you scale your current developments from 100,000s to 1,000,000s or 1,000,000s to 10,0000,000s? What are the biggest mistakes you have made in development? What projects/investments have learnt the most from? How would someone get started in development? How do you raise finance for developments? Of course, our speakers were more than equipped to provide excellent answers, information and practical tips across the spectrum of investing and developing. For example, when it came to the question: Is it still worth investing in London? London is actually classed as a ` safe haven` - (there are a lot of people who like pumping money into London because of its heritage and stable history). Economically, the current supply is not enough to meet the growing demand, which means property investors and developers are reaping the rewards of high property price growth. David and Kam both highlighted that yes, investing in the capital might seem costlier but with proven better returns on investment, a global demand for homes within the city as well as the fact that the Crossrail is set to drive values – minds were certainly swayed. Investors/developers can now use strategies which focus on, off-plan (buying pre-construction and then benefitting from capital value uplift), buy-to-let (with a focus on investing in a promising area that has good potential or capital growth) and buy-to-live (start to think about the property you’re potentially buying to live in as an investment opportunity). Premier Property Club Canary Wharf regularly sells out. Want to join us next month to find out what all of the fuss is about? Check out the next event here: “How You Can Avoid The Biggest Mistakes in Property Conveyancing & Not Lose Your Deal” – 27th February 2018. Our second most popular question then looked at, question 2: regeneration areas and how do you find where the next regeneration area is going to be? Is there a desired area fringe ? Is there poor-quality Housing Stock? Are there good Transport Links? What is the Workplace Proximity like? What Leisure activities are in the area? Is Social life important here? Are there any Government Initiatives going into the area? What Inward Investment is going in to the area? The information that Premier Property Club attendees get is practical, it’s information that they can use immediately. And this was just the start, with questions 3-7 from the list proving incredibly content packed, specifically answering the question as well as demonstrating that there are more ways to build on your property investments, build that multi-million-pound portfolio and stay ahead of your competition. We received some fantastic feedback after the PPC event as our events really do offer something for everyone. 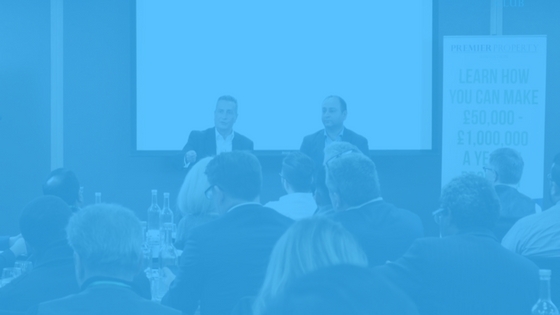 With esteemed speakers from within the property industry we’re ready to provide you with the answers to your questions – sometimes before you’ve even thought of them, just like the delegates did with David and Kam at the last PPC Canary Wharf. We would like to thank all of our investors and developers who attended Premier Property Club Canary Wharf this month, and if like us and like other PPC attendees, you still want to know more, to make 100% sure you’re maximising your opportunities in the property market, click here now to find out what’s happening at your next Premier Property Club. With limited spaces available (125 seats) book your place now, and we look forward to seeing you there. Copyright 2018 by Premier Property Club.